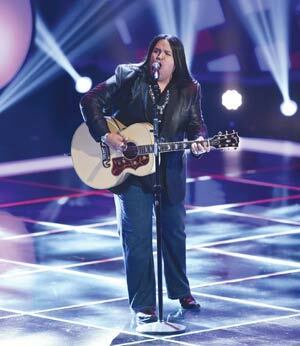 By Noel Lyn SmithThe recent season of "The Voice" may be over but Rudy Parris continues to gain strength from appearing on it. "I've gone from the local spotlight to the national spotlight and it's motivating," Parris said. Parris, along with his brother Abel Parris and manager Phil Pescosolido, stopped by the Navajo Times office Feb. 21 while on their way to Laughlin, Nev.
Parris, of Visalia, Calif., was a member of country singer Blake Shelton's team on Season 3 of "The Voice" on NBC. He was eliminated from the competition during the Oct. 30 knockout round against Terry McDermott, who became a friend while the men roomed together during filming. When McDermott was asked by show producers which contestant he would like to return to the show, he requested Parris, who appeared in the season's last three episodes and was there when McDermott was named runner-up. "It turned out that I did the last three episodes of the show, in succession," Parris said. "It was perfect. "Comment: For more on Navajo musicians, see Navajo "Anime-Core" Band and Navajo Nation Band at the Inauguration.